We prevent medical errors and hospital-acquired infections. We inform you of your rights and advocate on your behalf. We dispute inaccurate billing and negotiate insurance matters. We deal with the “red tape” of the health care system. We restore your peace of mind. We uplift your spirits and keep your mindset positive. Do you feel overwhelmed by your interactions with the health care system? If so, we are here to ease your burdens. We help coordinate every aspect of your health care and wellness, so you can focus soley on regaining your health. 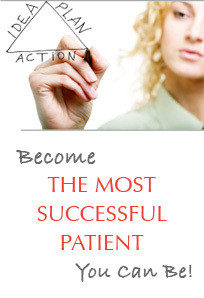 Our goal is to help you to become the most successful patient that you can be, whatever your individual circumstances are. We advocate on your behalf and ensure that you have the tools necessary both to prevent disease and to access the best medical care possible if illness strikes. Essentially, we will take care of everything from A to Z, so that you can get the peace of mind that you deserve. Your health care navigator will be with you every step of the way, providing you and your family with logistical help, emotional support, and the best patient advocacy possible. Rest assured, you are not alone. I feel that everyone needs a patient advocate. If I had not had one, I would have lost my job, had my credit ruined, and not had someone to whom I could turn in my greatest time of need. Thank you, Dalia. I will be forever grateful to you and Health Care Navigators.